When combining all of these factors, the counters make it very difficult for a criminal to pass a fake bill to businesses without getting caught. Cash remains king. Despite changes in payment patterns such as the rise of mobile and continued growth in debit cards, cash remains the primary form of payment of many consumers. A recent report found that 40 percent of all transactions were cash-based. It takes only one handoff for a counterfeit bill to work. Once a fake $20 or $50 bill enters the local circulation, it will keep changing hands until somebody discovers the impropriety. Sadly, once it's discovered, the last person holding the bill loses simply because they received a worthless piece of paper in exchange for goods or services. More fake cash is in circulation. According to the most recent data, the Secret Service seized $88.7 million in counterfeit bills in 2013. That's up 9 percent from the year before. Taking into consideration that they probably didn't seize all the fraudulent currency out there, that means there's likely more in circulation than ever before. The majority of all counterfeit bills use inkjet printer ink. Producing fake bills no longer requires a sophisticated operation involving a massive offset printing press plates. All it takes is a solvent to wash off the $1 or $5 bill's ink, some time to dry, and an inkjet printer to print new currency values on it. In 2013, 60 percent of all seized currency came from a digital printer of some kind. Counterfeiting arrests are on the rise. Since people only need solvent and an inkjet printer, the cost of entering the counterfeiting business is pretty low. As a result, the number of people arrested for counterfeiting rose 49 percent in 2013. 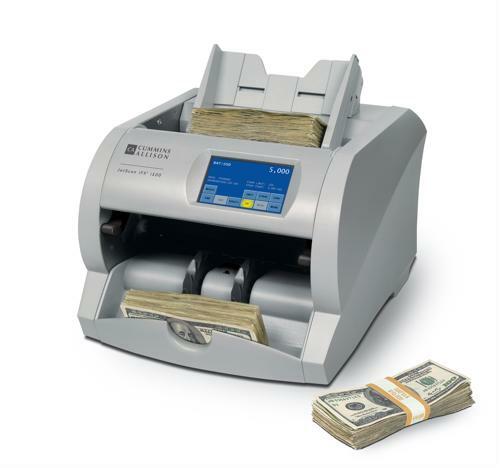 With all these facts, it's a good idea to consider using a cash counter in the back office as a defense against counterfeit bills.